The Esotec MW 162 is a 17 cm (6.5 inch) diameter mid/woofer that combines a clear and detailed midrange with a powerful bass response. Dynaudio's diffraction-optimized MSP cone improves imaging so that even at short listening distances a realistic, three-dimensional sound-stage can be enjoyed. Molding the cone and dust cap into a one-piece flat-membrane results in a controlled roll off and high dynamics. 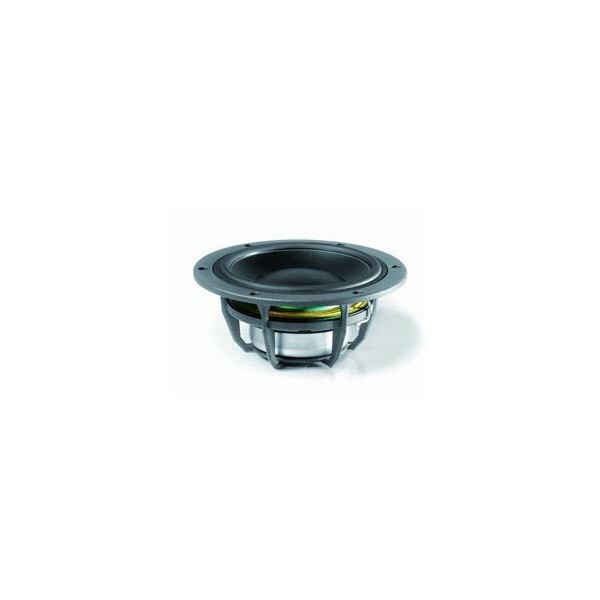 The 75 mm (3 inch) voice-coil is exceptionally large and allows a most precise conversion of the amplifier's signal to music. The result is un-compromised, direct music enjoyment. All of the Esotec MW model variants employ Dynaudio's oversized aluminium voice-coil, which feature an uncharacteristically large diameter coil wound on a strong, temperature stable former to drive the rigid MSP cone. The Esotec mid/woofers have all been upgraded with a new spider, which allows greater mechanical movement of the cone, increasing excursion while allowing a higher maximum SPL and improved low bass performance. The use of Dynaudio's large diameter aluminium voice-coils increases thermal handling capabilities tremendously, allowing the drivers to operate within an ideal temperature range, even at high continuous power levels and during powerful music transients. Dynamic impulses are reproduced precisely and without distortion, while impressive sound quality and high power handling capability are achieved. I've just finished* installing these in my car and have had about 10mins listening time with them and I'm pleased to say they are just as good as I remember! At present they're running actively off a Genesis Stereo 60 (one bridged per driver) so receiving up to 120wrms. They are band passed at 80Hz 24dB an octave and 2.5Kz @ 24dB an octave. They're matched with the MD102 tweeters being run off a Genesis Dual Mono. I've a Phase Linear Aliante 10Si for sub duty 63Hz and down, running in a massively undersized enclosure, so the Fb of the box is above the band the sub is playing. The sound is just as I expected and remembered-full of detail, vivid and live feeling without the colouration you find with other drivers-I've yet to set up my stereo's EQ or have a good play with the crossovers but the quick RTA of white noise I did is showing me a near perfect flat response, just a small hump in the 500Hz-2Khz region, centreing on 1250Hz and that will easily EQ out. Looking forward to having more time with the set up on these, but with such stella performance with ZERO tuning I know that these will be putting a smile on my face for years to come. *"Finished" in car audio terms is a misnomer as no audio system is ever complete and there's always a little tweeking to do! is this price for a PAIR x2 of the MW162 ?